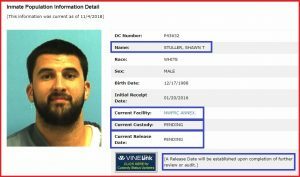 Shawn Stuller ReSentencing Transcript – Kent Hovind v. Robert Baty – The Great Debates! 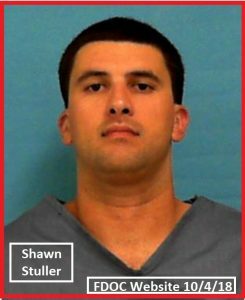 Shawn Stuller, Kent Hovind’s #1 jailhouse convert, was sentenced to 20 years in prison and has been whining about it ever since. Ultimately, Shawn got his do-over, based on ineffectiveness of counsel, and was successful in getting his sentence reduced to 5 years, most of which he has already served. Following is a file which contains the 35 page transcript of the hearing, judge’s decision and the re-sentencing of Shawn Stuller. 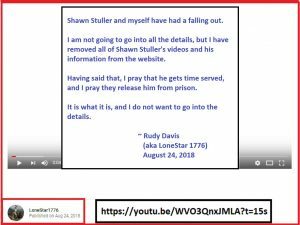 Rudy Davis (aka LoneStar1776) has been Kent Hovind’s and Shawn Stuller’s #1 YouTube promoter, until recently. A few weeks ago, Rudy announced that, for unstated reasons, that he has split with Shawn. In other reports, it has been alleged that Shawn is a “fraud” as to his reported conversion and commitment to the religion Rudy and Kent have been promoting. Time will tell, maybe, what that is all about. Still no release date posted on prison website!